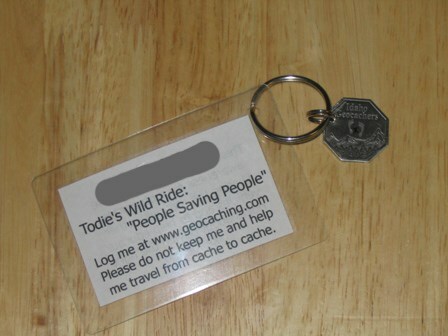 (TB1FN02) Idaho 2007 Micro Geocoin - Todie's Wild Ride: "People Saving People"
Todie's Wild Ride: "People Saving People"
In the hands of PBRGal. Use TB1FN02 to reference this item. 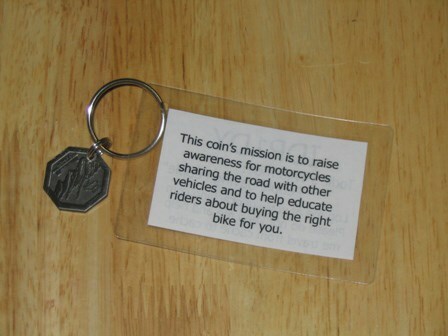 This mission of this coin is to raise awareness for motorcycles sharing the road with other vehicles and to help educate riders about buying the right bike for you. 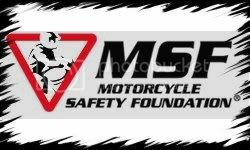 The MSF (Motorcycle Safety Foundation) recommends: buying the right bike for your needs and wants. "Functional Requirements: Buy the power you need, but only as much as you can handle safely. Large motorcycles are heavy, and you must be strong enough to push it, or pick it up if it falls over. But smaller bikes (e.g., a 125cc machine) may not have the speed, performance and ride you'll need if you plan to travel long distances. Consider the primary use of your bike. Don't buy a "trail" bike for highway use. Similarly, don't buy a "highway" bike if most of your riding will be off the road. Some motorcycles are built especially for trail use, with special tires and suspension. Other motorcycles have special characteristics for highway use, such as tires designed to grip pavement, and more powerful braking systems. If you have dual requirements, combination cycles are available that make a compromise between road and trail riding." 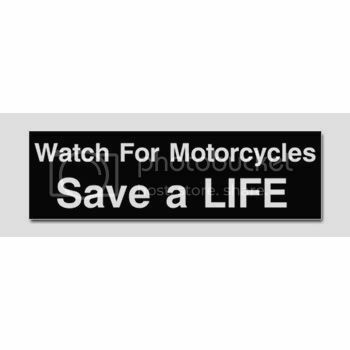 PLEASE HELP ME TRAVEL FAR AS I AM INVOLVED IN A MILEAGE/KILOMETER RACE TO SPREAD MOTORCYCLE SAFETY AWARENESS! Gallery Images related to Todie's Wild Ride: "People Saving People"
Gldnbuddha and I located this GC on our visit to his son's and to see a couple of spring training games. Will be taking it back to Calif.
We will be going to Arizona in 2 weeks and this TB is going with us. We'll find it a good home while we're there! Grabbed coin after the event. 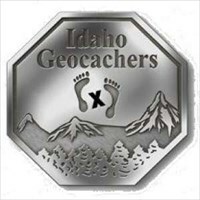 Will drop it off in a cache soon. I got this little guy all ready to start his mission.